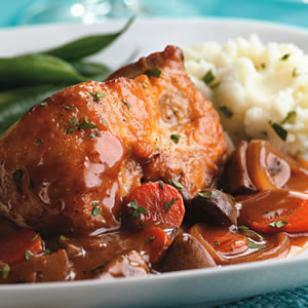 Here’s a quick version of Coq au Vin, a red wine-braised chicken-and-vegetable stew that usually takes the better part of an afternoon to make. Place flour in a shallow dish. Cut each chicken breast in half on the diagonal to get 4 portions about equal in weight. (Two will be smaller but thicker, the other two larger but thinner.) Sprinkle the chicken with 1/4 teaspoon each salt and pepper and dredge in the flour. Whisk water with 2 tablespoons of the leftover flour in a small bowl; set aside. Heat 1 tablespoon oil in a large nonstick skillet over medium-high heat. Reduce heat to medium and add the chicken. Cook, turning once or twice, until lightly browned on all sides, 5 to 7 minutes total. Transfer to a plate. Add the remaining 1 tablespoon oil to the pan; reduce heat to medium-low. Add mushrooms, carrots, onion and rosemary and cook, stirring occasionally, until the vegetables are softened and browned in spots, about 5 minutes. Add broth, wine, tomato paste and the remaining 1/4 teaspoon each salt and pepper. Stir until the tomato paste is dissolved. Bring to a simmer. Return the chicken and any accumulated juice to the pan. Cover, reduce the heat to maintain a simmer and cook, stirring once or twice, until an instant-read thermometer inserted into the thickest part of the breast registers 165°F, 15 to 20 minutes. Transfer the chicken to a serving plate. Increase the heat under the sauce to medium-high. Stir the water-flour mixture, add it to the pan and cook, stirring, until the sauce is thickened, about 1 minute. Serve the chicken with the sauce, sprinkled with parsley.